Have you fallen into a brunch rut, or you wish you could make your brunch outing as exciting as your Friday night (that’s left you with a hungry hangover)? These eight spots are sure to spice up your typical brunch routine. River North | 315 N. Lasalle St.
Saturdays and Sundays, 11 a.m. – 3 p.m.
Here’s a spot where you can sing the blues even when you’re happy, and hungry. With a live blues music setting the scene for their brunch crowds, there’s no better way to take in one of the city’s most gorgeous views of the Chicago River. Plus, Chef John Hogan’s menu is definitely non-traditional. Snack on one of their curated charcuterie boards with delicacies such as duck prosciutto, wild boar and fig terrine. But a can’t-miss is their famous whole roasted, wood smoked chicken for which the restaurant was created. It’s out of this world. But don’t worry; you can still get your favorite brunch cocktails with their house made Roast Bloody or a try a beermosa. And if you’re still recovering from the night before, they even have Hangover Soup to ease the pain. Logan Square | 2537 N. Kedzie Blvd. “Casual, simple yet sophisticated”: a very true self-proclamation from Lula Cafe. The northwest side neighborhood spot’s impressive farm-to-table seasonal menus balance out an accompanying laid-back vibe. And Brunch is no exception at Lula Cafe. You’ll get to mingle with the cool Logan Square locals while enjoying unique specialties such as their Bulgar Bowl with eggplant, sweet corn, peaches, basil, ricotta salata, a hard boiled egg and peanut vinaigrette. 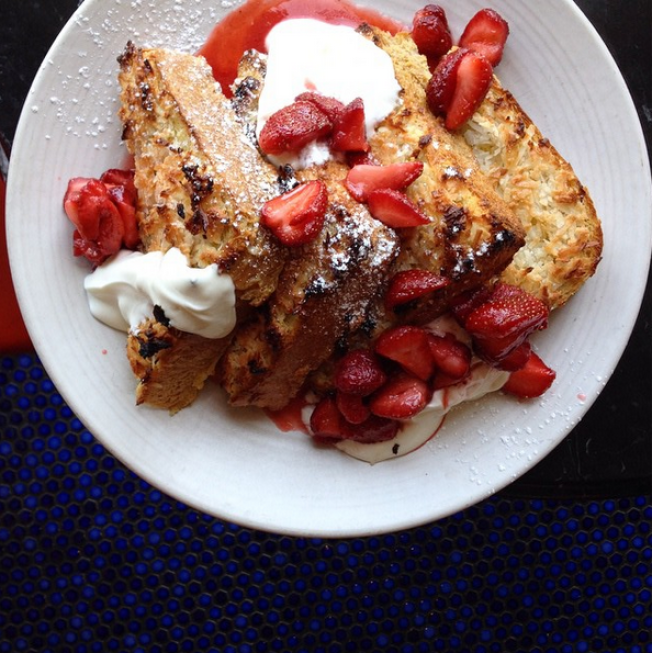 Or try their Cornbread French Toast with berries, sweet corn anglaise, and coconut streusel. New today pistachio crusted brioche French toast with Klug Farm raspberries & a white chocolate anglaise. Brunch until 2:30! Lakeview | 2901 N. Sheffield Ave. Regular ole’ brunch can get a bit boring – a modern Mexican brunch is anything but. Head to Lakeview to try some delicious and contemporary Mexican takes on your favorite brunch items. How do maple bacon pancake sliders sound? They make them with scrambled eggs and a maple hollandaise. Ay caramba! Or indulge in the chorizo benedict with crispy polenta. Hasta luego, for sure! Logan Square | 3057 W. Logan Blvd. Jam has been a hot spot and a cult favorite for years now. They even hold a coveted Michelin Bib Gourmand. What makes Jam so unique is their artisanal and innovative take on the classics. According to Chef Ian Voakes, “Jam reimagines the American diner with honed techniques and presentation to modify the classics with finesse to compose flavorful and well balanced dishes.” For example, order what seems to be a non-eventful egg whites entree and be pleasantly surprised by chive spaetzle, mustard JAM, almond beet emulsion, broccoli and spinach. Or if your sweet tooth wants to step outside the box, try their Malted Custard French Toast with macerated stone fruit, lime leaf cream, and pink peppercorns. I just spent a full week in Italy and now that I’m back, I’m already craving some authentic Italian brunch food. Although Italians don’t really do “brunch,” if they did, this is what they’d be eating. Mangia your heart out with starters like prosciutto and melone or an antipasti tray. Then dive right into some lemon ricotta pancakes, bucatini carbonara, or a selection of crostini including tuna conserva with runner beans, a poached egg, and green tomato. Buon appetito! River North | 118 W. Grand Ave.
I’ve been a big fan of the fresh, gourmet, and authentic Peruvian cuisine at Tanta since they opened. But now with their incredible brunch menu, they’ve become a favorite of mine all over again. If you really want to wake up your taste buds while feeling like you’ve traveled to South America, this brunch is for you. They have a selection of six tantalizing fresh Cebichesz (ceviche, or raw marinated seafood dishes), as well as items like Quiche Pastel de Acelga (Peruvian quiche with Swiss chard, gruyere cheese, and an organic fried egg) and a Chicharròn Waffle (crispy pork belly and panca chili honey). Finally for some dessert, try their duo of Alfajores. Zagat Chicago listed Tanta among the 15 Hottest Brunches in Chicago! Read more on our Facebook page! Wrigley View | 3700 N. Halsted St.
You really want a non-traditional brunch? How about dining on a delectable prix fixe menu while a sassy drag queen dances and serenades you to your favorite pop hits? Their “Divalicous Brunch” is a $29.95 two-course menu that includes building your own mimosas, bloodies, prix fixe menu, or sangrias. I’ve always love Kit Kat’s food and their insanely extensive cocktail and martini list, but being able to go during the daylight and enjoy their food and brunch cocktails with a side of cheeky (literally) entertainment definitely constitutes Sunday funday. Old Town was in need of some new brunch options. And now we have a fresh addition that feels, well, old. Pomp & Circumstance is a throwback to yesteryear with all the bells and whistles that made the first part of the 20th century so cool. It also has a slight Southern/French or even New Orleans vibe and the best part is that the food and cocktails are anything but ordinary. Feed your nostalgia with croque madame, pork belly hash, or a fried green tomato BLT. A standout is the blackened trout po’boy served with creole slaw and green tomato chutney.